Twitter On my experiences using Twitter. Ubuntu About my favorite Linux distro, the best hope yet to take Linux to the masses. What If? What Not? On Sun’s belated, and incomplete, release of parts of Java as open-source. Sell support? Why not give it away for free? What’s in a name? GNU, Linux, or GNU/Linux? What’s in a Name? Linux, Ubuntu, Linux Ubuntu, or Ubuntu Linux? Is Twitter starting a school? Dr Watson: Does RMS Twitter? 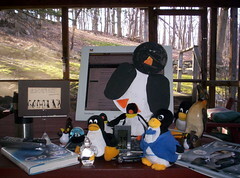 Dr Watson: Who wrote Linux? If Noble Scoble and Blogger Dave Use Twitter, Shouldn’t You? Patrick Mueller – IBM’s first open-source contributor? Wolfgang Amadeus Mozart: Why censor him? The Army Honors Its Own, As Should All Of U.S.